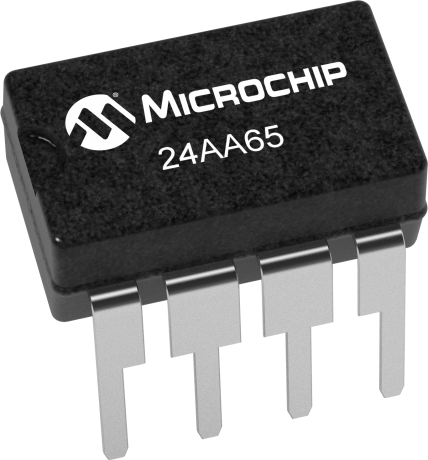 The Microchip Technology Inc. 24AA65/24LC65/ 24C65 (24XX65)* is a “smart” 8K x 8 Serial Electrically Erasable PROM. This device has been developed for advanced, low-power applications such as personal communications, and provides the systems designer with flexibility through the use of many new user-programmable features. The 24XX65 offers a relocatable 4K bit block of ultra-high-endurance memory for data that changes frequently. The remainder of the array, or 60K bits, is rated at 1,000,000 erase/write (E/W) cycles ensured. The 24XX65 features an input cache for fast write loads with a capacity of eight pages, or 64 bytes. This device also features programmable security options for E/W protection of critical data and/or code of up to fifteen 4K blocks. Functional address lines allow the connection of up to eight 24XX65’s on the same bus for up to 512K bits contiguous EEPROM memory. Advanced CMOS technology makes this device ideal for low-power nonvolatile code and data applications. The 24XX65 is available in the standard 8-pin plastic DIP and 8-pin surface mount SOIJ package.